So I decided what to knit, though it’s none of the options I presented in my last post. I cast on for the Autumn Arbor stole (first introduced to me by graciechiao) with the Cherry Blossom Silk Lace from Sundara. I believe firmly in tinking over frogging for virtually any kind of mistake, no matter how far back it is. 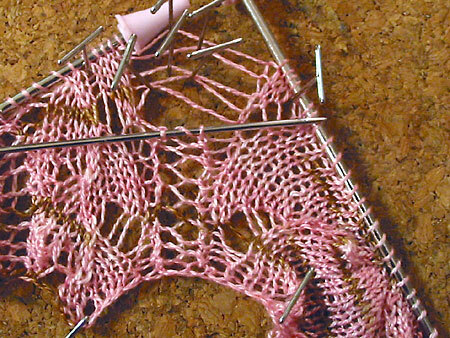 Frogging is reserved for whole-project errors, or if I have less than two rows completed. They say in programming that you introduce a new bug for every ten lines of code you write. I believe there’s a similar rule for knitting, that you make a new mistake about every X stitches. 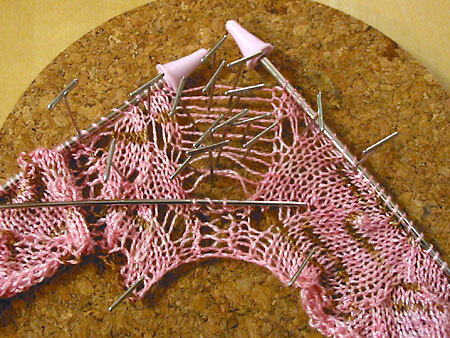 Tinking means re-knitting fewer stitches and that means you’re less likely to make a new mistake in the course of your repair. Of course, proper set-up for tinking makes all the difference. Clear your workspace. Get good light. Banish children, pets, husbands, and liquor to another room. Failure to do so is like being a surgeon at Seattle Grace. I’ve moved the stitches to be dropped to a US 2 straight needle and capped the ends of the circular with point protectors. Do not forget the point protectors. There is nothing more frustrating than approaching the end of a so-far successful tink only to have the perfectly good stitches fling themselves off the needles like lemmings off a cliff. I’ve pinned the pattern out and am ready to drop the offending stitches. As I dropped the stitches, I carefully separated out all the strands with pins. This helps with figuring out what rows you need to re-knit and also prevents you from re-knitting the strands in the wrong order. The live stitches have been transferred to a US 0, as the US 2s were too fat to pick up the stitches after I dropped them down past the mistakes. I knew I’d ended on row 20, so I counted off the strands in the big ladder and figured out I should begin re-knitting on row 10. This is where charts really shine, by the way. Since charts are always written from the right-side perspective, you don’t have to do any mental reversing of the stitches when you tink. Tink, tink, tink, up we go. 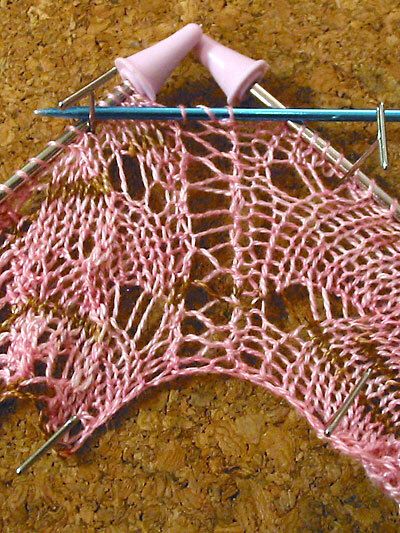 The pace of tinking is much slower than the pace of knitting, but it’s still much faster to tink three stitches than to re-knit eleven rows of 109 stitches each. Since I already had the pattern partially pinned out, I went ahead and pinned out the rest of it so I could get a sense of how well the variegation was behaving in the pattern and how big the finished product might be. Half a repeat is roughly 18 inches wide and 3 inches tall, so I’m thinking ten full repeats will be enough to make a good-sized wrap for my tiny Japanese mother-in-law. Onward! CogKnition posted this on July 11th, 2009 @ 4:04pm in Tutorials, Unfinished Objects | Permalink to "Tink, Tink, Tink"
… what? I don’t introduce a bug every ten lines of code. I am totally better than that. Although I don’t knit, it was fun to find out where the terms “tink” and “frog” came from. I’m a terrible programmer and I’m pretty sure I don’t do that either. But I remember seeing a thread on Slashdot about putting in easter eggs and about half the participants jumped in and went “DON’T PUT THEM IN! YOU INTRODUCE A NEW BUG EVERY TEN LINES OF CODE!” Makes you wonder how they’re defining “bug” and “line of code”. Whoa, that’s some intense tinking. I’m a ripper, it hurts my brain to go back and figure out where I went wrong, but then again, my kids wouldn’t let me concentrate anyway. I really enjoyed this post by the way. Haha. I like the eagle line. If eagles could knit they would be tinking constantly. 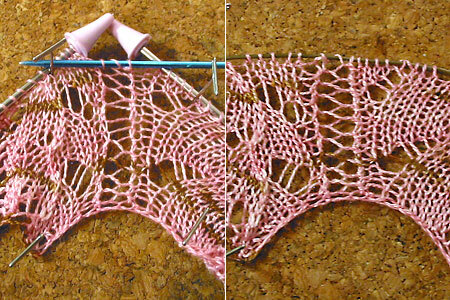 Tinking is way better than frogging but it’s difficult in lace patterns (doing either is, actually) without messing up. Still, I always fix mistakes. I tell myself that I actually love knitting so doing a little more on any given project’s a GOOD thing.